The Indian Air Force will soon be phasing out the old Avro aircraft and have sought a request for proposal, a senior IAF official said today. The Avro aircraft will be replaced with modern ones. A request for proposal (RFP) has been sought by the authorities, Air Marshal Jagdish Chandra, Air Officer in-Commanding in-Chief of IAF Maintenance Command here, told reporters on the sidelines of an air show at Sonegaon Airbase today. India has issued a request for proposals for 56 cargo aircraft to replace its air force’s aging fleet of Hindustan Aeronautics Ltd.-built Hawker Siddeley 748M Avro aircraft, according to a defense ministry official. Under the deal, the first 16 aircraft will be directly procured from the chosen foreign vendor, which will then have to partner with an Indian firm that will manufacture the remaining 40. Out of those 40, 16 must have 30% indigenous components, while 24 must have 60% locally procured parts, the official says. The Indian air force (IAF) is looking at several options including IL-114 variants from the Russian Ilyushin Aviation Complex, Ukrainian An-148 Antonov, the twin-turboprop European EADS Casa C-295 and Italian Alenia C-27J Spartan medium-sized military transport aircraft. “The RFP made it clear to foreign players that they will have to select an Indian partner for this project,” the official tells Aviation Week. The first aircraft is expected to be delivered in the next four to five years, after an official agreement is signed. The entire deal is estimated to be worth $2.5 billion to $3 billion. The program is expected to boost manufacturing of transport aircraft in the country and bring in new business opportunities for Indian private players in the aviation market. The twin-engine aircraft is planned to have a 6-8 ton payload capacity, cruise speed of 800 kph (500 mph) and a range of 2,500-2,700 km (1,600-1,700 mi.). The IAF is estimated to be operating around 30 vintage Avro HS-748 aircraft, capable of carrying loads of up to 7 tons. The aircraft were inducted during the 1960s to transport both personnel and equipment. State-run Hindustan Aeronautics Ltd. (HAL) will not participate in the project because it is busy with the licensed production of Su-30MKI fighters and upgrades of the Mirage, MiG-29 and Jaguar aircraft for the IAF, the official says. HAL also will be involved in the licensed production of India’s Multi Medium Range Combat Aircraft, once the deal for 126 jets is signed with France’s Dassault. While several private companies have shown interest in the programme, there have also been some foreign proposals, especially from Ukrainian firm Antonov for a possible programme for replacing Avro. The MoD's acquisition council gave the go-ahead to issue a global tender to procure the aircraft, of which the first 16 will be bought off the shelf likely from a foreign manufacturer. 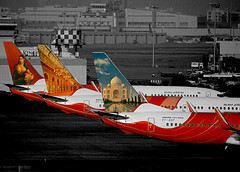 The remaining planes will have to be built in India through a partnership deal with indigenous aviation manufacturers. India has set the ball rolling for another mega defence deal by floating the global tender for over Rs 13,000-crore acquisition of 56 transport aircraft to replace the ageing Avro fleet of the Indian Air Force. The tender, or request for proposal (RFP), was issued to eight aviation majors, including Embraer, Lockheed Martin and Airbus, on Wednesday. In the first such move to get Indian private companies to enter the military aviation sector, the RFP specifies that while 16 aircraft will be bought off-the-shelf from the foreign vendor, the remaining 40 will be manufactured in India by a private Indian Production Agency (IPA). The foreign aviation company will select the IPA based on qualification criteria for the IPA stipulated in the RFP. Defence PSU Hindustan Aeronautics Ltd, which dominates the Indian military aviation sector and is overburdened with fighter, helicopter and other projects, is being kept out of the project. IAF chief Air Chief Marshal Norman Anil Kumar Browne had earlier held that IAF was keen to exploit the Indian private industry for the programme to replace ageing Avro aircraft. On Thursday, a defence ministry official said, "The project ensures inflow of production technology to the IPA in phases wherein the value addition in the manufacture by the IPA will gradually increase from 30% to 60%." "The IPA will also obtain the transfer of technology for maintenance, which will allow it to provide life time product support and maintenance up to the depot level. The project is aimed to provide the Indian private sector a unique opportunity to enter and enhance their traction in the Aerospace sector," he added. The Indian Air Force (IAF) has barred Indian PSUs like Hindustan Aeronautics Limited (HAL) from taking part in the $3 billion aircraft deal. The IAF has shortlisted five foreign aircraft firms to buy 56 new aircraft. Yeah right. India has a lot of PSUs building high performance cargo aircraft, all of whom are going to be extremely disappointed, I suppose ! Last month, Minister for Heavy Industries and Public Enterprises Praful Patel launched an outburst against the Indian Air Force's deal to replace its 56 ageing Hawker Siddeley (HS) Avro 748 transport aircraft. The attack seems to have hit its mark, as the Ministry of Defence (MoD) has quietly extended the date for submission of proposals, without giving any reason. The move has caused heartburn among the IAF as well as domestic private industry players. The IAF had issued a Request For Proposal (RFP) to replace the aircraft on May 8, 2013 and the proposals were to be submitted by October 8, 2013, which was subsequently extended to December 8, 2013. The submission date has now been shifted to March 8, 2014, the information accessed by Mail Today revealed. The IAF confirmed the extension but did not respond to requests made regarding the cause. A senior MoD official, when contacted, said: "Mr. Patel may have his reason and beliefs for writing to the defence minister, but we cannot ignore his letter on this subject." Last month, while responding to Patel, Defence Minister A.K. Antony had ordered an 'examination' of the deal without committing to delay or hold it back. IAF officials then strongly rejected Patel's claims in their meeting with the MoD, and were reportedly relieved that Antony had not delayed or held back the deal. "It is rather unfortunate. Can anyone doubt that we need to replace these aircraft? Hope that the delay does not last beyond these three months. Whatever the procedures are, they have been followed and the deal cleared only after that. Need was to sensitise Mr. Patel and not retreat into a shell," a source said. The primary reason for opposition by Patel on behalf of the public sector undertakings (PSUs) lies in the nature of this deal. When in June 2011, the IAF indicated a need to replace these transport aircraft, a detailed examination was done in the MoD to evaluate the situation at the only Defence PSU capable of manufacturing and assembling aircraft in India, the Hindustan Aeronautics Limited (HAL). It was then decided to acquire these aircraft from foreign Original Equipment Manufacturers (OEMs) who had to tie up with one or a consortium led by Indian private sector players and announce an Indian Production Agency (IPA). The deal also involved the off-the-shelf purchase of 16 initial aircraft followed by manufacturing and assembling of the remaining ones in the IPA with a complete Transfer of Technology. "The point being that while the HAL has its hands full, there is a pressing need to integrate and galvanise our private sector in the aerospace sector if India is to seriously pursue indigenisation," said an MoD official. Reacting to this, Air Marshal (Retd) P.S. Ahluwalia said: "The plan was to phase them out by 2015 towards maintaining flight safety and operational standards. So the case for replacing these planes is genuine. There is a lot of misinformation regarding participation of PSUs". Hahaha. Pee Pee strikes again! First it was Civil Aviation, now Military Aviation! Boeing makes planes. Airbus makes videogames! India's Avro programme to replace obsolete Hindustan Aeronautics-built HS-748 transports will be handled by the nation’s private sector. The decision – taken during a Defence Acquisition Council meeting led by defence minister Arun Jaitley – means state-owned airframer HAL will have no role to play in the estimated $2.2 billion deal. The procurement of 56 new transports through the Buy & Make route received "acceptance of necessity approval" in July 2012. According to this outline, a foreign original equipment manufacturer would deliver 16 aircraft of the selected type, with an Indian production agency from the private sector to produce the other 40 under license. “Following the change of government the existing schedule for this programme remains in place, and we will respond to the request for proposals shortly,” says Federico Lacalle, regional sales director, Airbus Defence & Space, Asia Pacific. The company is offering its C295 tactical transport, with Alenia Aermacchi promoting the C-27J. India's bid submission deadline has been extended until 28 August. New Delhi's requirements will test the capabilities of its fledgling private sector aerospace companies, as its requirement calls for the local partner "to produce 16 aircraft with a minimum of 30% value addition to be achieved in India in the first phase". This figure should rise to 60% for the remaining 24 aircraft, it adds, with the local company to also gain the capability to perform Level D servicing. India’s private sector aerospace firms are today mainly dependent on small orders from state-run defence firms such as HAL and Bharat Electronics. A major step forward would be required before they are able to undertake full assembly and systems integration tasks. Flightglobal's Ascend Fleets database records the Indian air force as operating 62 HS 748s, the oldest of which was built in 1961. Global vendors have given the Indian Air Force’s (IAF) RFP worth $3.5 billion to replace the ageing Avro aircraft a miss. With foreign aircraft-makers showing no interest in bidding, the defence ministry has been forced to extend the deadline for seeking price bids to October, the fourth extension in the last 18 months, according to the Financial Express. In 2012, the Defense Acquisition Council cleared the proposal to acquire 56 aircraft. Europe's Airbus and India's Tata Sons have bid for a multi-billion dollar contract to replace the Indian Air Force's ageing fleet of Avro cargo planes, as New Delhi looks to boost the role of the local private sector in modernising its armed forces. Under the bid, estimated by analysts to be worth at least $2 billion, Airbus' Defence and Space unit and Tata's Advanced Systems would replace the 56 Avro jets with Airbus' C295 transport planes, the European manufacturer said on Tuesday. Airbus would supply the first 16 planes in "fly away" condition from its own assembly line, while the subsequent 40 would be manufactured and assembled by Tata Advanced Systems in India. They would be the first military planes built by an Indian private company on Indian soil, with current manufacturing dominated by state-run Hindustan Aeronautics. ^^ Awesome - hope this encourages more private participation in Military aviation. 2. However, what about the C27J Aliena? From a layperson's perspective, the C27J looked extremely attractive, especially in terms of its STOL characteristics, especially operations from unprepared surfaces. 3. Shukla-ji, what is your personal perspective on what the IAF is looking for, as an HS-748 replacement? 4. This looks unlikely, but did the IAF have the A400M on its radar, sometime in the past? The plane is of course, unproven as of now, and the IAF was in all probability, better off going with the proven C-130J and the C-17s, two amazing aircraft, to complement its other fixed wing transport fleet of Do-228s, An-32s and Il-76s. If the Tata-Airbus deal goes ahead, what is your personal opinion about the IAF looking at the possibility of the A400M as well, as a viable alternative, in case there is future trouble with the US? True, the IAF may not need any extra planes of any type (apart from the HS-748 replacements) right now, and the A400M is quite huge a plane. Alenia Aermarchi has decided not to offer its C-27J Spartan transport aircraft to India, telling IHS Jane's that it is too advanced for the basic requirements of the Medium Transport Aircraft (MTA) programme. "Alenia Aermacchi has always worked for the development of its products aiming at the top of the technology and performances. The C-27J Spartan is the most modern multimission tactical transport aircraft available on the market," a company spokesperson said on 31 October. "The Indian Air Force [IAF] Avro Replacement programme instead calls mainly for a basic medium transport aircraft and, therefore, Alenia Aermacchi decided to not participate to the tender," he added, concluding: "India remains a very strategic market for Alenia Aermacchi proprietary products, including trainers and maritime patrol aircraft." The defence ministry (MoD) is likely to issue a fresh international tender for building 56 transport aircraft in India to replace the venerable Avro HS-748 in the Indian Air Force (IAF) inventory, said ministry sources. Only a single bidder — an Airbus Defence and Space, and Tata Advanced Systems Ltd (TASL) consortium — had bid in response to a MoD tender that closed on October 22. The Airbus-Tata consortium has proposed to build the Airbus C295 medium transport aircraft. “The director general of acquisitions will take a decision on this when he returns to office on Monday from his current travel,” said the ministry spokesperson. In May 2013, the MoD had issued a global tender —called a “request for proposals” or RfP — to original equipment manufacturers (OEMs), including US firms, Boeing and Lockheed Martin; European multinational Airbus Defence & Space; Antonov of Ukraine; Swedish company Saab; Ilyushin of Russia; and Italian company, Alenia Aerom-acchi. These OEMs are required to partner an Indian private company to build 40 aircraft in the country, after delivering the first 16 off-the-shelf, all within eight years. Yet, for various reasons, only one OEM has bid. Among those left out is Antonov, of Ukraine, which had partnered Larsen & Toubro (L&T) in a proposal to build the An-132 aircraft in India. However, political turmoil in Ukraine, following Russia’s annexation of Crimea, has stalled its bid. In August, in a major government reshuffle in Kiev, Antonov was moved from under the charge of Ukraine’s industry ministry and placed under the ministry of finance. The IAF rejected Antonov’s request for more time to let its new ministry clear its bid. On August 25, Ukraine called a snap election, which was eventually held on October 26. On October 20, with Kiev in the throes of electioneering, Antonov wrote again to the IAF, asking for more time. With that request turned down, Antonov has not bid. The Swedish company, which wanted to supply the Saab-2000 aircraft, has not bid because the MoD is unwilling to let it build all 56 aircraft in India. The RfP insists that 16 aircraft must be supplied in flyaway condition. Saab, having shut down its line in Sweden, wants to build all the aircraft in India, which the RfP does not provide for. Russian manufacturer, Ilyushin, wants to supply the IL-214. A defence ministry procurement official say it would be difficult to continue with a single vendor. How stupid! Why won't they let them build all of them here, unless SAAB couldn't arrange for local partner. Indian defense ministry is likely to decide on the sole Airbus-Tata joint bid to replace Indian Air Force’s (IAF) fleet of 56 Avro aircraft fleet with C-295 military transport carrier in the coming week. Defense ministry sources said the next meetings of the defense acquisition council (DAC) would deliberate on the bid worth multi crore rupees. Though the meeting was scheduled to be held on February 9, it has been delayed by a few more days. In May 2013, the Ministry had issued a Request For Proposals (RFP) to original equipment manufacturers including US firms Boeing and Lockheed Martin, European multinational Airbus Defence and Space, and Antonov of Ukraine among others. However, only a single bidder — Airbus Defence and Space and Tata Advanced Systems Ltd (TASL) consortium — had bid for the proposal in October last year. Under the current defense procurement policy, single vendor situation is not entertained unless cleared by the DAC. A decision to this effect was expected to be taken by the Ministry in November last but was delayed as defense minister Manohar Parrikar had sought more information. The defense sources said a decision could be taken soon. One of the options, besides selecting the consortium, is to go in for re-tendering in which the Indian companies become the main player rather than the foreign ones. The $2-billion pilot involving the private sector for manufacture of a new fleet of transport aircraft for the Indian Air Force is floundering and could be shelved by the Defence Ministry that is reviewing the requirement as well as the bidding process. The government plan to involve only the private sector in the replacement programme to create an alternate aviation industry besides state-owned Hindustan Aeronautics Limited had not garnered much response last year when only one bidder emerged for the Avro replacement project - an Airbus-Tata consortium offering the C295 medium transport airlifter. The defence ministry has now set up a specialised committee to review the programme and to evaluate why other private players did not come up with bids for what was considered as the largest project given entirely to Indian players. Preliminary indicators do not look positive for the Airbus-Tata alliance with a strong view that the tender has to be rebid with a new set of conditions that would make it easier for other players to come in. An upcoming change in the buy Indian category of defence procurement policy that will have specialised rules for `Make in India' could be used to push the project forward for a re bid. Under the new set of rules the lead for the project could be taken by the Indian company, instead of the foreign vendor. However, IAF will have to convince the Defence Ministry on the requirement of 56 transport aircraft to replace its ageing fleet. While the UPA government had cleared the project, the Parrikar-led ministry has questioned the need for a replacement given that parallel projects for medium transport aircraft are already being pursued. While the AN 32 fleet is being upgraded, India has C-130 J airlifters in service and is expected to order them in greater numbers. On replacement for the Indian Air Force’s Avros, he [Venkat Katkuri, head of Airbus Defence and Space, India] said Airbus-Tata Advanced Systems Limited (TASL) had not yet been awarded the contract. “Our proposal is going through the process of evaluation by the end customer. Nothing has been finalised,” he said. “We are offering the C295, wherein with Tata, we will support the Indian private sector in making a significant leap to creating a modern and efficient aircraft assembly line, fed from an ecosystem of domestic suppliers and in initiating the production of a market-leading military transport aircraft,” he added. Airbus and TASL have submitted a joint bid to replace the IAF’s fleet of 56 Avros with the Airbus C295. It has been approved by DAC. Now negotiations have begun for the final contract before it can be inked sometime next year. In a boost to Make in India in military sector, defence minister Manohar Parrikar has cleared a proposal to develop six indigenous surveillance planes for the coast guard. Hitting two birds with one stone for Make in India, the planes to be used for the project would be the C-295 transport aircraft to be built by Tata-Airbus consortium. This would help in increasing the order for the Avro aircraft replacements being built for the Indian Air Force. "The air force wants 56 planes for replacing their fleet of Avro planes and the coast guard order would take it to 62," defence sources told Mail Today. This would also help in bringing down the cost of the Tata-Airbus jointly manufactured plane due to increase in numbers, they said. The two planes share a lot of commonalities, coming from a common stable. They don't share much in common, other than the fact that both are high winged turboprops. The -295 is based on the Spanish CN-235, while the ATR was developed by Aerospatiale. The -295 apparently, has much better short field capabilities compared to the ATR. They started off differently, but now the C-295 has seen modifications to have parts commonality with the ATRs, since they are all under Airbus's relevant division. The basic design is quite different indeed (as even borne by the different external looks), and yes, the C-295's short field performance and overall figures, is perhaps bettered by the one competitor which was perhaps the first choice. its civilian use would make it attractive under UDAN scheme... better than Dornier any day.. According to the Chief of Air Staff, Air Chief Marshal BS Dhanoa, due attention is being paid to all assets of IAF, fighters and transporters included, and that "contract negotiations for 56 C-295 aircraft to replace the ageing Avro fleet are likely to commence shortly". Separately, official sources indicated that the Border Security Force (BSF) is also looking at four C-295s for movement of its troopers within the country. That takes the projected number to 60, but as the aircraft will be made in India by the Tata Group, their number should go up eventually, keeping in mind the regional connectivity plans of the Civil Aviation Ministry, particularly in India's northern Himalayan cities. The air chief's statement is significant as it clearly indicates that the process of acquiring the C-295s is now on a firm track. The aircraft is to be made in India by the Tata Advanced Systems Ltd. (TASL) in partnership with Airbus, and as per their announcement in 2014, once a contract is awarded, Airbus Defence and Space will supply the first 16 aircraft in "fly-away" condition from its own final assembly line in Spain and the subsequent 40 aircraft will be manufactured and assembled by TASL. The arrangement will include undertaking structural assembly, final aircraft assembly, systems integration and testing, and management of the indigenous supply chain.